APA Group's largest security holder, Petronas Australia Pty Ltd, has sold its 111.3 million securities, equivalent to 17.3 per cent of APA. Morgan Stanley managed an institutional bookbuild to a broad spread of domestic and international institutions. Managing director Mick McCormack said "Petronas has been a strong supporter of APA's business since listing, and we are grateful for their involvement over the last 12 years. Petronas has advised that its decision to sell follows a rationalization of its investment portfolio." APA Group subsidiaries are among 248 liable entities in the first phase of the Liable Entities Public Information Database (LEPID) published by the Clean Energy Regulator. This means they are liable to pay the carbon price from 1 July. The APA entities include APT Allgas Energy Pty Ltd, APT Petroleum Pipelines Pty Ltd and East Australian Pipeline Pty Ltd. The LEPID is being published through a staged schedule as information is made available to the Clean Energy Regulator. The first phase are entities identified through emissions reporting under the National Greenhouse and Energy Reporting Act 2007 and natural gas suppliers. Clean Energy Regulator Chair Chloe Munro said "We've written to around 330 entities advising we believe they are likely to be liable entities for the 2012-13 financial year. These entities account for over 95 per cent of emissions covered by the carbon pricing mechanism." "Following that consultation we have published 248 entities that we are satisfied are likely to be liable entities. These entities account for around 70 per cent of emissions covered by the carbon pricing mechanism." DUET Group is among 248 liable entities in the first phase of the Liable Entities Public Information Database (LEPID) published by the Clean Energy Regulator and liable to pay the carbon price from 1 July. Its liable subsidiary is DBNGP (WA) Transmission Pty Ltd.
Energy World Corporation received another query from the ASX about a large fall in its shares price to 49.5 cents. The company said it knows of no reason, apart from recent media articles that questioned aspects of its accounts. AFT Corporation's revenue in the March quarter fell to $1.35 million. The December quarter revenue was $2.5 million and full year 2011 revenue was $19.49 million. Its March 2011 quarter revenue was $4.9 million and it had positive net operating cashflow of $0.76 million. This March quarter its net operating cashflow was minus $0.55 million. Energy Developments subsidiaries are among 248 liable entities in the first phase of the Liable Entities Public Information Database (LEPID) published by the Clean Energy Regulator and thus liable to pay the carbon price from 1 July. These include EDL CSM (NSW) Pty Ltd, EDL CSM (Qld) Pty Ltd, EDL NGD (NT) Pty Ltd, EDL NGD (Qld) Pty Ltd, and EDL Projects (Australia) Pty Ltd.
Simon Henry, who is conducting an off market takeover of Hydromet, now owns 28.4 per cent of the company's shares. Director Morgan Parker intends to recommend that shareholders accept Mr Henry's offer as no higher offer has materialized, the offer appears reasonable, and his associates (Sell & Parker Pty Ltd, Ssor Pty Ltd and Ms Bree-Annan Parker) do not wish to remain minority shareholders. Sell & Parker Pty Ltd intends selling all of its shares on market for no less than the offer price of 4.8 cents per share. Mr Parker's remaining associates intend accepting Mr Henry's offer. Mr Parker's associates' shares represent in aggregate 12.8 per cent of the company, said Hydromet. 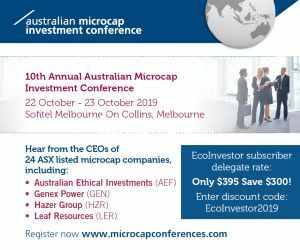 Australian Renewable Fuels director Michael Costello acquired 3,095,000 shares at 1.5634 cents per share, a total value of $48,387. The company reported a positive net operating cashflow of $2.3 million for the March quarter. "This was driven by sales resulting from increased volume and a favourable sale price position. Favourable feedstock prices were also a contributing factor. This resulted in a net cash inflow at the end of the quarter of A$1.1 million. Importantly, this was driven by the business trading results and not by capital raisings or other one offs," said managing director, Andrew White. However, total cash at the end of the quarter was minus $4.8 million. The company has processed 15 tonnes of Recycled Mill Oil (RMO) at the Barnawartha plant. "Yield results and processing costs were consistent with other feedstocks used in the plant and quality tests confirm the quality exceeds the Australian, USA and European Biodiesel Standards," said Mr White. The second shipment of 4,000 tonnes of biodiesel has been shipped to Gavilon (USA) and discussions are underway to continue the export program. As part of its intention to create a sustainable food division, Green Invest has signed an option to acquire assets associated with Ecofish International Pty Limited (Ecofish) and RAD Aquaculture Pty Ltd (RAD). The GNV said the acquisition will complement its existing water and energy businesses. "The ability to secure sustainable food sources is becoming an increasingly important global issue, with population increases creating increased water, energy and protein demand, all of which have a significant impact on national economies and of course the environment," said the company. "The proposed purchase will enable the Company to participate as principal in an industry where it will have substantial management experience and intellectual property and where significant earnings can be achieved within the context of the capital structure of the Company." "Ecofish operates a sophisticated closed tank indoor filtration system that produces premium fresh native and brackish (estuarine) fish, namely Barramundi and Murray Cod (Australian Freshwater Grouper). The Ecofish and RAD assets under the option are a 20 acre facility and plant and equipment at Glenview, Queensland and; and associated intellectual property relating to the technology for the operating and monitoring systems. GNV is intending to re-commission and expand the Glenview facility to 350 tons of annual production. The facility has permits to allow it to expand up to 750 tons annually, which Green Invest says could be achieved through a staged process over a five year period. It intends to develop the facility to become south east Asia's primary training facility for high density, intensive re-circulating systems specializing in Australian native fin fish. GNV will need $7.5 million for the transaction and working , which it says it will achieve through a mixture of debt and equity. Shareholders will need to approve various parts of the proposed acquisition. The company also intends to make further announcements in relation to its water and energy businesses over the next few weeks, which will further strengthen its focus around its three major platforms of sustainability - water, energy and food, said chairman, Peter McCoy. As part of the re-structure of its operations, Mission NewEnergy has completed final production runs in Malaysia and the refineries will be put into care and maintenance. In India the company will substantially downsize its operations. The company said further consolidation to conserve shareholder funds is likely and the company is assessing divestment of all non-core assets. Nanosonics has raised $15.5 million through a placement to institutional and sophisticated investors at 53 cents per share. The placement was led by fund manager Allan Gray (formerly Orbis Investment Management (Australia)), which committed $10.6 million to the placement. Shaw Corporate Finance acted as participating broker. Following the placement, the company has cash of over $20 million, enough it said to strongly drive the commercialization of its environmentally friendly Trophon EPR medical disinfection unit and continue developing its new product pipeline. A share purchase plan will be offered to shareholders at 53 cents per share. Style has put itself in voluntary administration, and appointed Gess Michael Rambaldi and Andrew Reginald Yeo of Pitcher Partners as administrators. The board said it will assist the administrators as they complete their review of the company. Vmoto's new low cost version of its 80L electric scooter has completed development and is ready to be launched into the market in May at a price below EUR1,000. In the March quarter the company was operationally cash flow positive, albeit at only $56,000. The company's E-Max 110LD+ electric model won an endurance test and acceleration test in the moped category in Monaco's EVER ecological vehicle international exhibition. LNG expects to complete its due diligence of WestSide Corporation this month, although it says there is no certainty that it will make a takeover offer. LNG has also been in negotiation with two other parties in relation to potential transaction opportunities to acquire their gas reserves. During the March quarter, WestSide Corporation's Transitional Environmental Plan (TEP) under the Environmental Protection Act was approved, commencing transitional arrangements to bring the dam construction standards of its Petroleum Lease PL94 into compliance with new policy standards. WestSide has also developed an Underground Water Impact Report (UWIR) for its coal seam gas operations in PL94 under the requirements of the Queensland Water Act 2000. The UWIR is a routine requirement and is due to be submitted to the Department of Environment and Resource Management on 29 June. It was released for public viewing and comment on 24 April. Lynas Corporation said it has commenced defamation proceedings in Malaysia against the "Save Malaysia Stop Lynas" group and various media organizations. The proceedings relate to what Lynas says are various false and misleading statements published in Malaysia concerning Lynas and its business. Meanwhile, rare earth prices have been declining sharply. Compared with the December quarter, the average Mount Weld "basket price" fell by 25 per cent during the March quarter to US$92.20/kg on a China FOB basis. The "basket price" also declined by 25 per cent to US$41.98/kg on a China domestic basis. The March quarter Mount Weld "basket price" on a China FOB basis was essentially unchanged from a year ago, as prices declined from unsustainably high levels during the middle of 2011, said Lynas. However, the "basket price" on a China domestic basis was 81 per cent higher compared with a year ago reflecting the impact of ongoing rationalization and restructuring of Chinese rare earths supply." Galaxy Resources has raised $2.25 million via the share purchase plan held in conjunction with the $30 million placement to support its proposed merger with Lithium One Inc. Galaxy received applications for a total of 2.92 million shares from eligible shareholders. The share purchase plan funds will be used for working capital for the Mt Cattlin Mine and Jiangsu Lithium Carbonate Plant, to accelerate development of the Sal de Vida Lithium Project in Argentina, debt servicing, capital raising fees and merger costs. 22 October 2012 is the date for a court hearing of proceedings by Odin Energy Ltd against Blue Energy and its subsidiary, Kompliment Pty Ltd.
Carnegie Wave Energy has won a $9.9 million grant under the Federal Government's Emerging Renewables Program (ERP), and secured a $16.25 million equity facility, enabling its first grid-connected wave energy project to proceed. Carnegie has an existing $12.5 million grant agreement from the WA Government, and $5.5 million of this will be put toward the project. The combination of State and Federal funding enabled Carnegie to approve the location of the project at Garden Island near Perth. The project is expected to cost $31.2 million. About 50 per cent will come from the two government grants and the balance from the equity facility. The facility is with New York-based Australian Special Opportunity Fund, LLP managed by The Lind Partners. The design of the 2 MW facility will now commence, with expected commissioning in late 2013. Carnegie will need government approvals for the construction and operation, and will carry out further community consultation. The project will give Carnegie its first revenue from power sales, and power supply arrangements are expected to be finalized soon. The Lind Partners, LLC invests in a broad range of industries and economic environments and focuses on companies with market capitalizations between $25 million and $1 billion. The equity facility can be drawn on as needed over a 36 month period. Carnegie will receive an initial $500,000 via a $350,000 convertible security with a term of 24 months at zero interest rate and a pre-payment of $150,000 in shares. Carnegie has paid Lind a commencement fee of shares worth $170,000 based on the average price before the agreement date. The agreement is secured by 6 million Carnegie shares. Thus on 1 May Carnegie issued 9,984,108 shares under the agreement. 3,984,108 shares were issue at 4.2659 cents as consideration for the $170,000 Commencement Fee and 6 million were issued for no consideration "as collateral security for the Company's performance of its obligations under the agreement". It also issued Lind with 9 million unlisted options exercisable at 140 per cent of the average daily volume weighted share prices for the 20 trading days prior to the date of the agreement. Lind will invest $175,000 each month for the term of the agreement. Carnegie can increase each month's share subscription up to $450,000 at its discretion if certain conditions are met. The price at which shares will be issued is 92.5 per cent of the average of the five preceding days. Carnegie said the deal minimizes dilution. At no time can a monthly tranche of shares exceed 0.4 per cent of Carnegie's market capitalization without Carnegie's approval. On one occasion only, the issue price can be 130 per cent of the daily average. Carnegie can pause share subscriptions for up to three months in any twelve month period, and has the right to terminate the agreement at any time at no cost. Lind's managing partner, Jeff Easton said "I have been following the company closely for three years, visited their research facility and participated in their capital raisings." However he has not said whether the fund will hold the shares or sell them as they are issued. Carnegie said it can substitute other more favourable equity funding at its discretion. Eco Quest received acceptances for 90,630,480 new shares under its fully underwritten pro-rata non-renounceable entitlement issue. The shortfall was 44,444,007 shares. Shares in Eden Energy fell to a new all time low of 1.8 cents on 4 May. European Gas says an independent assessment shows it has significant contingent gas resources in its French portfolio of coal bed methane licenses. BeicipFranlab (BF), the consulting subsidiary of the French Petroleum Institute, estimated the contingent resources for assets in the Lorraine and Nord Pas de Calais regions in north-east and north-central France as follows - 1C at 4.62 trillion cubic feet (tcf), 2C at 5.89 tcf and 3C at 7.46 tcf. European Gas said it is ideally positioned to begin converting these into gas reserves, which represent about five years of France's current total gas consumption. France imports almost all of the gas it consumes. Chief executive, Frédéric Briens, said "The contingent resources established by BeicipFranlab are a confirmation of the very large potential of our gas assets in northern France and of the strategic importance these assets could have for France. Furthermore, these indigenous energy resources greatly benefit from both a well-developed gas transport infrastructure and a premium gas market commanding one of the highest gas prices in the world. Greenearth Energy has selected the site for its proposed flagship geothermal energy project, the Geelong Geothermal Power Project (GGPP) in Victoria. The Stage 1 exploration stage and the Stage 2, 12 MWe demonstration stage will be on the Holcim (Australia) Pty Ltd Moriac quarry site, 8.5 kilometres north of the Alcoa brown coal-fired power station at Anglesea. The Proof of Resource stage will involve the drilling of a well to 4,000 metres and conducting tests to assess temperature, geothermal fluid flow rate and formation permeability. If all goes well, a second well will be drilled to demonstrate Proof of Concept, and if successful this will lead to Stage 2 of the project. Managing director Mark Miller said "In selecting this site, Greenearth Energy has sought to address many of the topics raised via the site selection process. Being located in an industrial extractive industry zone, in an existing operating quarry, close to established infrastructure attempts to ensure that any environmental and amenity impact of a geothermal operation will be significantly minimized." Hot Rock and Energy Development Corporation (EDC), the world's largest integrated geothermal company, have signed agreements for incorporating joint venture companies in Chile and Peru for three of of Hot Rock's projects.These are Longavi in Chile and Quellaapacheta and Chocopata in Peru. The agreements cover funding of each project up to financial close. Following the transfer of tenements into the project companies, Hot Rock will receive an initial US$1.8 million in cash and another US$1.2 million subject to certain conditions. EDC will acquire a 70 per cent interest in each project company and will sole fund the exploration stage up to US$12 million per project. The total expenditure for sole funding of the three projects is up to US$36 million. In the later resource development stage, EDC with 70 per cent equity and Hot Rock with 30 per cent will contribute to each project on a pro-rata basis. HRL can contribute its own funds or request EDC to advance a loan to HRL to fund evaluation and production drilling through to securing project finance for each project. The estimated cost of the evaluation stage for each project is in the order of $US38 million. If all projects proceed from exploration stage to financial close, an estimated total of US$150 million could be spent over the three projects, they said. (ASX: HRL). Island Sky has still not been able to source sufficient capital to continue, said chairman, David Lindh in the annual report. "During the year the group continued with skeleton staff and overhead reductions. Distribution and cashflow from sales remain slow and will probably continue to be slow for some time. The Company is also continuing to terminate distributors who have been unable to generate sufficient sales," he said. Discussions with investors interested in the subsidiary company should enable details of a reconstruction of the US company to be released in the near future, and this may involve a reduction in Island Sky's shareholding in the US subsidiary. "The Board is therefore now actively looking for other investment opportunities which will provide better value for shareholders," said Mr Lindh. Managing director Richard Groden writes that despite continued demonstrations of its water from air machines in a number of countries, "the scale of our sales activities has continued to be less than expected." The company sold a container of Skywater 300 machines to the Philippines, and more orders are expected. It is working with the government of The Ivory Coast and Harbinger Capital, and if successful this will result in the sale of containers of Skywater 300 machines for schools, government buildings and farming cooperatives. Two Skywater 300 demonstration machines were purchased, one for Ivory Coast and one for Ghana. The Skywater machines that were donated to Haiti following the earthquake are still in use and continue to provide clean water to help alleviate the cholera epidemic, he said. One of our distributors in Mexico is working on a project in the Yucatan to provide water to communities using our Skywater 300 machine powered by a Biofuel Gasifier designed by All Power Labs at the University of California at Berkeley. A 300 machine was purchased and is currently being shipped. "A container of Skywater 300s has been ordered by our distributor in Saudi Arabia. Delivery is planned for early summer. The distributor has been working with the Water Authority to assist in the overwhelming demand for water that is not being satisfied by the Desal Plants alone." LNG expects to complete its due diligence of WestSide Corporation this month, although it says there is no certainty that it will make a takeover offer. An assessment by Aquatic Bioassay and Consulting Laboratories of California confirmed that Metgasco's undiluted produced water is not toxic, but some freshwater aquatic species are sensitive to the salinity. The aquatic bioassay tests indicate that no adverse effects due to salinity would be expected on freshwater aquatic species from the coal seam gas water at a dilution of 50 per cent, it said. "This is a positive result, indicating that with appropriate treatment, even simple dilution, produced water can be managed safely." said the company. As part of its environmental program, Metgasco continues to evaluate a range of approaches to handling produced water so it has a range of acceptable options for future developments. Metgasco is evaluating two options to supply gas to businesses in northern NSW: compressed natural gas and micro LNG. Gas production could significantly displace imported LPG and diesel fuels currently in use, and a marketing study revealed strong demand in the region.